You will also know that I don't have much compassion anymore for the greedy, evil, pignorant (pretend ignorant), and ecologically illiterate bastards who refuse to pull the plug on this brewing hell on Earth. My patience has worn right through. Now I find myself also losing patience with those who aid and abet the bastards, out of their own ignorance, selfish wishful thinking, or just plain being behind the times. investigates how climate change impacts resource scarcity, migration, and conflict through the lens of US national security and global stability. Whether a long-term vulnerability or sudden shock, the film unpacks how water and food shortages, extreme weather, drought, and sea-level rise function as accelerants of instability and catalysts for conflict. Left unchecked, these threats and risks will continue to grow in scale and frequency, with grave implications for peace and security in the 21st century. Does that sound like a hand-holding movie to you? A benevolent primer on the greatest threat ever to face our species. A gentle introduction to the greatest ever crime against humanity? No, right? It sounds hard-hitting. It sounds like it pulls no punches. It sounds like it's trying desperately to make America (and, hopefully, the rest of the world) safe again. Yet a New York City movie critic describes it as "stylishly edited and timely" but "too angry, exhausting and repetitive while failing to be inspirational, balanced or truly enlightening" (from Rotten Tomatoes). WTF? A movie about the inching-ever-closer climate-racked end of the world has to be inspirational? Balanced? Enlightening? Give me a break! Give the blessed children a break! I am reminded of an Earth Day post from 2012 in which I suggested the early morning equivalent of this scenario: If I discover a fire in a crowded movie theatre and start yelling that people should leave by the nearest exit, I don't want to hear anyone responding, "You didn't say please." I am doing my duty by alerting you to the danger. Now you should just head for the exit. Don't question. Don't ask for a second opinion. Don't wait to get your ticket refunded. Just get out! Do we feel SO entitled in this society that we can't watch a documentary about the urgency of climate disruption without expecting enlightenment and inspiration for the same price of admission? Sheesh. By the way, several critics appreciated the movie. For example, Frederic and Mary Ann Brussat call it "a startling documentary that presents new twists on the global climate change crisis and what to do about it." Hmmm, sounds like they were inspired and enlightened! 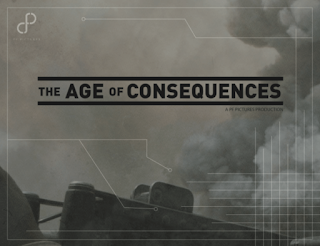 Watch for The Age of Consequences to find a cinema near you soon. * Full disclosure: I helped fund the making of this movie through a Kickstarter campaign, however, as of today I have not yet seen it. In fact, I'm trying to figure out why I didn't get my very own copy of it as a Kickstarter reward!